Inspired by recipes from around the world, our expert Knorr Chefs have created an exciting range of noodles. 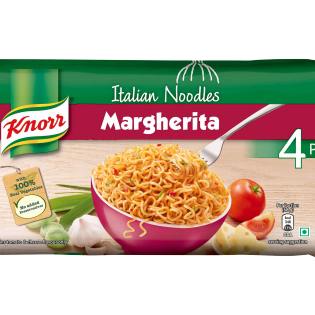 The tangy and cheesy flavour of Knorr Italian Margherita Noodles will bring to your taste buds the ultimate Italian experience! 1. Pour 225ml (approx 1 ½ cups) of water in a Pan and heat to bubbling boil. 2. Add noodle cake into the pan. Throw in the seasoning. 3. Cook for 3 - 4 minutes or until noodles are done, stir occasionally. 4. Chef's Tip: Add 1 cup sautéed veggies for added Crunch! Serve & enjoy hot.